New Screen Prints for sale! Apr 18, 2013 | Comments Off on New Screen Prints for sale! 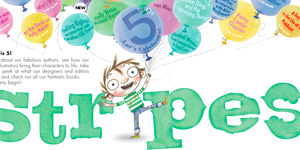 Stripes Publishing are celebrating their 5th birthday! See an exclusive insight into the published work of Stinky Whizzers artist, Phil Alderson, on Stripes special microsite here. Sep 22, 2011 | Comments Off on Stripes are 5! Last chance for christmas orders! Make sure you don’t leave it too late to gift your loved ones with an original Stinky Whizzer Print this Christmas! Last orders for canvas prints – 10th December! Last orders for giclee prints and posters – 17th December Happy shopping! Dec 08, 2010 | Comments Off on Last chance for christmas orders! Are your kids toes, happy toes….? Mar 04, 2010 | Comments Off on Are your kids toes, happy toes…. ?